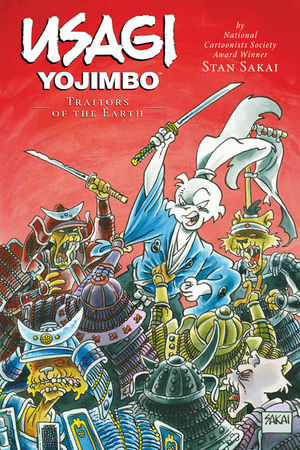 Stan Sakai draws Usagi Yojimbo, wary but unnoticed, slipping past a group of border guards. Usagi's thought bubble says, "Luck is with me! The guards are walking past without giving me a second look!" Stan Sakai draws Jei's demonic shadow creeping up the blade of Inazuma's sword as she holds it. Inazuma's voice balloon says, "There's a dark shadow creeping up my blade!" Stan, Stan, we know perfectly well what's happening in the panel already; we can see it! Thing is, there's utterly banal, redundant, patronising, self-expository commentary such as this in every single issue of Usagi Yojimbo. If Stan Sakai was as good a writer -- or simply, merely, as restrained a writer -- as he is an undeniably talented artist and Japanophile, Usagi Yojimbo could be one of the great American comic books. But, alas, kuso, shimatta, he isn't, and it sure as heck ain't. Does the cover of this latest graphic novel compilation depict an actual storyline inside? Any bet says Stan wrote Usagi saying, "I'm surrounded by an army of zombies!"